Six years ago, the secondary school site at Got Matar was a bare field. Now it is very visible from space! 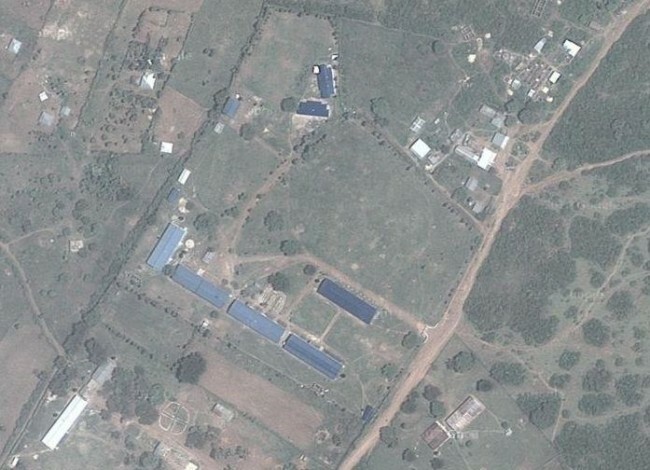 If you look at the 2012 Google “Sat” photo, you will get a good idea of the layout of the school, with its blue roofs. The four long buildings are the classroom blocks, each with 3 classrooms plus an extra room (school office, library, computer room etc). One of these was built each year from 2006 to 2009. To the north-western corner of the row of 3 classrooms, is a new science laboratory, financed by the government. In line with this, the two small buildings – one blue, one white – are toilet blocks. The Women’s Centre, funded by the Chave Collison Trust, has been built slightly further to the north-east. The other two buildings with the darkest blue roofs are two brand new teachers’ housing blocks, also constructed by the government. The long white roof to the south-west is a new classroom block at the primary school, also built by the government.